Today’s journey was to Arlington National Cemetery. I wasn’t entirely sure what to expect out of this trip because I wasn’t sure what the right frame of mind to be going was. Am I supposed to be going out of some perceived patriotic duty to pay my respects to our fallen soldiers? Is it wrong to take pictures of such a solemn place? How can I explore without feeling like I’m taking advantage of the space – treating a landscape dotted with the dead like it’s just another monument? Upon arriving, we debated between taking a tour tram or just walking. We decided to walk and I’m glad we did. Arlington, to me, is a place to be explored by foot. It’s nice to stop occasionally and reflect on what you’re seeing and to think about what this place means to so many different people. Arlington is steeped in history, glory and tragedy. To see it with the blare of a tour guide through the loud speakers and amongst dozens of chatty tourists doesn’t seem like the right way to see it. We headed straight for the Tomb of the Unknowns. We definitely wanted to see the changing of the guards, which happens every half hour in the summer. The scope of the cemetery was somewhat overwhelming – looking out over the grounds and seeing the headstones disappear into the distance was an impressive sight. The temptation of Arlington is to simply observe the perfect lines of white headstones without remembering that those are more than headstones – they are also markers of graves, where countless families have grieved the loss of a loved one. 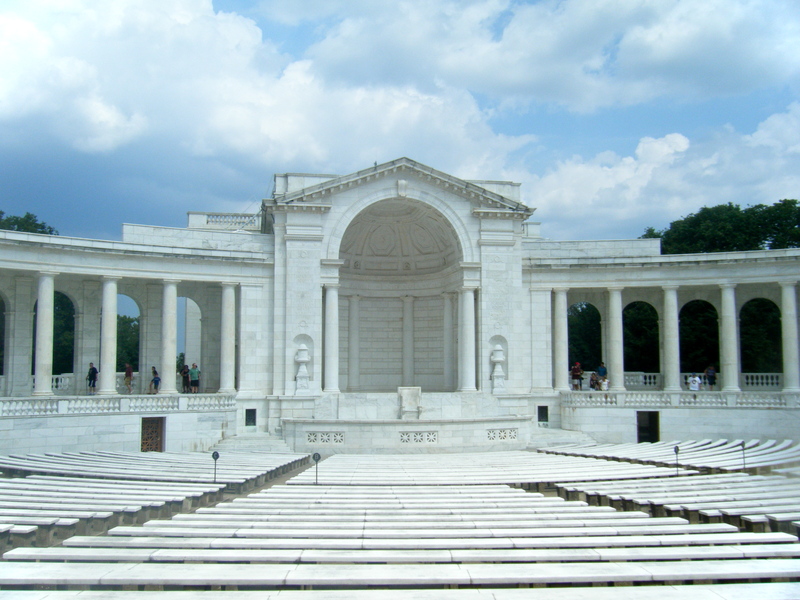 We got to the Tomb of the Unknowns while a changing of the guard was already occurring, so rather than come in on the middle of one we took some time to explore the surrounding area, including the Memorial Amphitheater, made of beautiful white marble. After doing some poking around, we went over to the Tomb to ensure we had a good line of sight. I liked getting there early because it gave me a chance to watch the single sentinel (as they are called, according to Arlington’s web site) performing his solo duties. There was an odd beauty in the rigidity and orderliness of his movements, walking from one end of the tomb to the other, pausing to look out, swinging his leg out to strike one shoe against the other. It might seem comical to some, but to me it was moving. The stiffness of the routine is meant to honor the unknowns and all those who have died in service to the country – anything less than perfection would dishonor those servicemen and women. The changing of the guard ceremony was similarly impressive in its perfect choreography and absolute precision. I also liked being among a crowd of people and not a person making a sound. The air reverberated with the chirp of birds, the click of the sentinels’ shoes and the occasional order barked by the head guard. It was a solemn and powerful experience. I thought a lot about what this ceremony might mean to different people. Certainly for those who consider themselves ardent patriots or who have themselves fought in wars for the United States the ceremony is extremely poignant. But I don’t consider myself an ardent patriot. It seems hard to blindly ascribe honor and dignity to any military proceedings when the military itself has been involved in so many acts full of dubious honor. What would someone who considers themselves anti-war get out of this ceremony? And yet, it’s all too beautiful and too full of meaning to be easily dismissed. Appreciating the changing of the guard is sort of like appreciating another religion’s practices, I decided. Someone who considers themselves a devout Christian may not understand or agree with everything that is said in done during a typical Buddhist service. And yet, many people can still respect and appreciate traditions that are clearly sacred and meaningful. 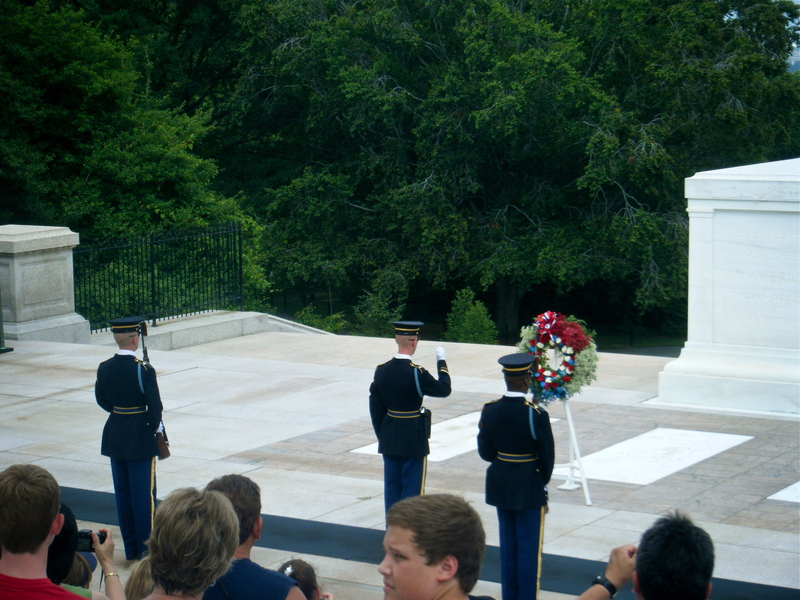 I think the changing of the guards is a bit like that – even if you don’t support the military or struggle with viewing it as an honorable institution, you ought at least to be able to recognize the intense honor and respect present at the Tomb of the Unknowns. After the changing of the guards, we went to JFK’s gravesite. I was interested to see this because (besides the obvious interest of the site) we had recently watched the movie the Fog of War for an upcoming class. The film is a documentary that has former Secretary of Defense Robert MacNamara offering his perspective on the events that defined his term as secretary. When talking about the death of Kennedy, he mentions that he went to Kennedy’s current gravesite with Jackie Kennedy and that the two agreed it was the most beautiful spot in Arlington. It was a lovely spot, offering a vista of the mall and the distant Washington Monument and right below the Arlington House. We didn’t stay long there (the damned heat!) but I am glad I got to see it. We left the cemetery after that, which was unfortunate I thought because I would have liked to explore more. But the group was losing steam and we at least saw what was probably most important. I am glad I went. In fact, I’m a little surprised at how much I enjoyed the trip. I think Arlington is worth visiting no matter how interested you are in it. It is a place of incredible meaning for so many different people, and that, in my opinion, makes it worthwhile.